Tools always make great gifts - long-lasting and thoughtful - and are especially appreciated when they are good quality. 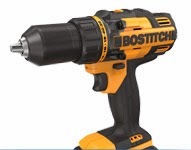 Walmart are now offering Bostitch tools - dependable performance and, of course, great prices. At the moment it's free shipping for orders over $50, so get a start on your Holiday shopping!